After months of making these little units as leaders and enders, I finally made them into blocks and stuck them on the wall. I’ll probably rearrange a few, but this is basically how they go. This morninging I printed some butterfly designs for the white blocks. It would make a lot more sense to trace them before I assemble the top. 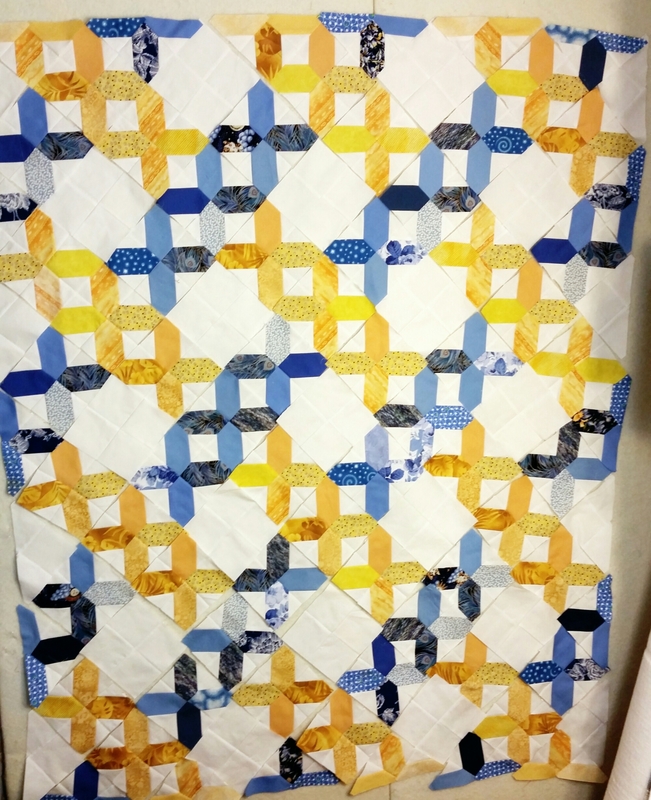 I’m linking up to Design Wall Monday at Patchwork Times. Check over there and vote for your favorites! Love this quilt. What is the pattern or block? Thanks, me, too! It’s from Scraps, Inc, and I saw it on a quilt that Pam made. Thanks for stopping by. Lovely blues and yellows, love it! Looking forward to seeing what you do with the white squares. I love your layout and your color choice. Very clever.